Winter and Snowman Crafts Kids Can Make! 1. Before class print out the snowman pattern, outfits, and writing sheet. 2. In class have your children color the patterns and then cut them out, and the glue the clothes to the snowman. 3. 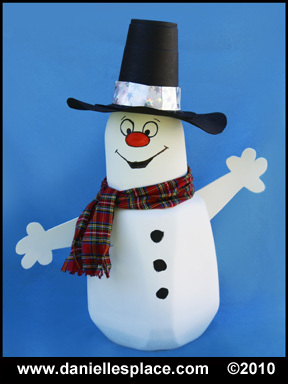 Give each child a writing sheet and instruct them to write about the snowman they created. 3. 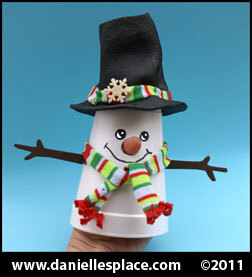 You can also have your children make the snowmen into a paper dolls so they can dress and undress the snowmen. Cut the snowmen out, and draw tabs on the clothes, and then cut out around the tabs. Free Instant Digital Download - Writing sheet not included. 1. Print out the snowman eyes, nose, and boots pattern. 2. 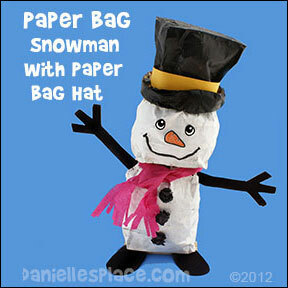 To make the head of the snowman crinkle up scrap paper and stuff a bag about half full. Tie off the end, and paint the bag white. 3. To make the body of the snowman fill another paper bag almost to the top, and then fold down the top edges over each other and tape them down. Paint the bag white. 4. To make the snowmans hat roll down the edge of another paper bag about 1 1/2" from the top of the bag. Roll it down again , and then one more time. Don't worry too much about wrinkles. Paint the bag black or any color you would like. 5. Glue the body to the head and then glue the hat on the head. 6. Draw eyes and a carrot nose on white paper, and then color in the nose with the orange colored pencil. Cut the eyes and nose out and glue them to the head. Draw on a mouth with the black marker. 7. 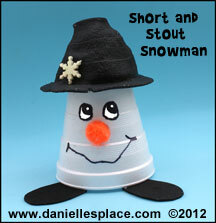 Cut feet and arm shapes from black construction paper and glue them to the snowman. 8. To make the coal buttons wrinkle up black construction paper and glue it to the snowmans body. 9. Cut a strip of paper about two inches wide to glue around the snowmans hat. 10. Use the crepe paper to make the snowmans scarf. Cut little slits at the end of the crepe paper to make it look like a scarf. 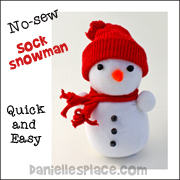 These little snowmen are so fun to make! You never know how they will look until you are done. No two look alike. 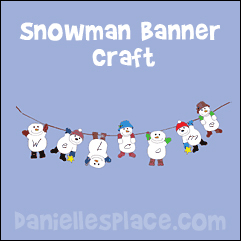 Things that You Want to Use to Decorate Your Snowmen such as: Ribbon, Buttons, Felt, Twigs, etc. 1. Remove the label from the water bottle. 2. Use a funnel to fill the bottom of the bottle with sand or dry rice to about one inch. This keep your snowman from falling over. 3. Hold the bottom of the bottle with one hand and grasp the bottle about two inches up from the bottom with the other hand. Twist the bottle like you would a blown up balloon. If the bottom part of the bottle has indents, blow into the bottle until the indents disappear. 4. Insert a pen or something long and skinny inside the bottle to punch out any areas at the top of the bottle that were dented in after twisting. When you have a shape you like, screw the lid back on the bottle. 5. You can also make a melted snowman by pushing down on the top of the bottle to make it flatter. Replace the lid when you have the desired affect. 6. Paint the bottle with white paint and let it dry. If you are using acrylic paint, you will probably need two layers. 7. To make the top hat draw two-inch circle on black craft foam and cut it out. Take the cap off the bottle and place it in the middle of the craft foam circle. Trace around the outside and then cut out the circle. Replace the lid and place the cut out part of the circle over the lid. Paint the lid black to match the craft foam rim of the hat. Glue decorative ribbon around the hat. 8. To make the cap cut the top off a sock so that it is about three inches long. Tie the cut end with a string. Make a matching scarf with the leftover part of the sock. 9. Cut a carrot nose from orange craft foam. You can use real buttons or cut button shapes from craft foam to glue to the snowmans body. 10. Use real sticks or pipe cleaners for the arms. 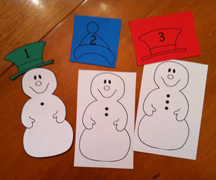 Kayla used this snowman craft to make a counting file folder game for young children. She printed out twelve snowmen with hats. She wrote numbers 1 - 12 on the hats and then added a different number of bottoms to each snowman. Children then match up the snowman to the corresponding hat. Check out the complete directions on mpmschoolsupplies.com. Children learn new words while having a great time. This game is played like Bingo except the children only have to mark three words in a row to win the game. shiver, snow blower, shovel, snow globe, earmuffs, jack frost, snow skis, downhill, winter scarf, bobsled, icicle, snowman, snowball, fireplace, snow, hat, sled, ice, and cold. Cut the cards apart, place them in a bag, shake the bag, and pull one card out at a time, showing your children the pictures as you call out the word. Children can use buttons, foam shapes, or coins to mark their cards. 1. To make the head cut the bottom off one 8-oz. cup about 2 1/2" from the bottom. 2. Draw a face on one side of the cup using permanent markers and/or construction paper. 3. Punch a hole in the back of the head near the cut edge. 4. Place the head over the bottom of another 8-oz. cup so that the hole in the face cup is about 1/2" from the bottom of the cup. Place a brass brad through the hole of the head cup and punch it through the inside cup. Place your hand inside the cup and spread out the brad. 5. To make the arms and hands cut a pipe cleaner in half. Form the two halves into arms and fingers and stick through the body cup. Fold down the end inside the cup and tape the ends down so they down come out. 6. To make the bottom cup cut the bottom off the 16-oz. cup about two inches from the bottom. 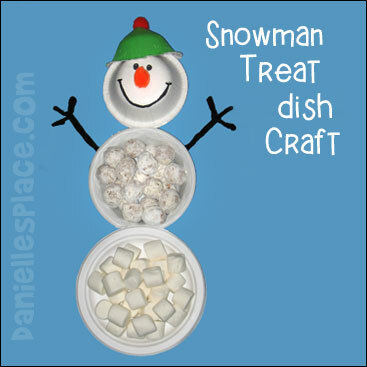 Place treats in the cup and place the top of the snowman over the bottom cup to cover it like a lid. To make it more secure you can also attach these two pieces with a brass brad in the back. Stick the brad in the bottom cup so that the prongs are sticking out. Then place the top cup over the bottom cup while inserting the brad into the cup. Spread out the prongs. 7. Draw black dots on the body of the snowman with a marker for the buttons. 8. Cut the toe off of an old sock and roll up the cut end. Place it on the snowmans head. 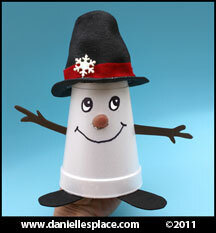 "Snowman Needs a Hat" Printable Book"
What kind of hat does a snowman need? Children will enjoy reading this printable book to discover a wide varieties of different kinds of hats and which hat is best for a snowman. Does Snowman need a baseball cap? Does Snowman need a top hat? Does Snowman need a sun hat? Does Snowman need a cowboy hat? Does Snowman need a rain hat? Does Snowman need a pirate hat? Does Snowman need a dress hat? Does Snowman need a chefs hat? Does Snowman need a hard hat? Snowman needs a winter hat! 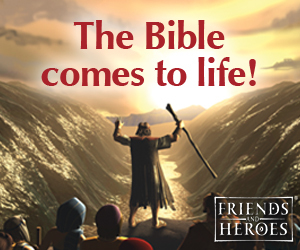 This printable book is available to members only. 2. Cut around the book pages. Do not cut apart the cover and back page of the book, pages 1 and 2, 3 and 4, 5 and 6, etc. 3. Fold the cover page and all the other pages in half so that the print is showing. Stick pages 1 and 2 inside the cover page so that the folded edge of the pages is facing out. Do this for all of the pages, putting them in order as you go. The folded edge of the cover should be on the left and the folded edges of the other pages should be on the right when assembled. 4. Staple the pages together along the folded edge of the cover. 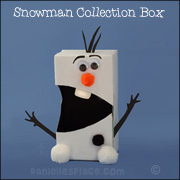 Children will love playing with these interactive snowmen. As they sing the song that goes along with the craft they pull out the snowmans nose. 1. To make the hats preheat your oven to 250 degrees. 2. Place a Styrofoam cup open side down on an old cookie sheet. 3. Turn on the oven light so you can see inside the oven. As soon as you see the cup start to melt, in about 15 to 30 seconds or maybe a little longer, open the oven door and pick up the cup. 4. Gently pull out the rim of the cup. You may have to put your hand in the cup and press the center of the cup out if it collapsed a little. The cup cools very quickly so try to keep it inside the oven as you work. start to get a rim shape for the hat you can press down on the rim (press it into the cookie sheet) to make it stick out more. This seems like it is hard but it really is pretty easy. If Make sure you turn on your oven vent and you have your windows open because the fumes from the melting cups probably aren't good to breath in. I used an 8.5 oz. cup for the smaller hat pictured and a 16 oz. cup for the larger hat. If your cups are melting too fast to work with them, turn down the heat in your oven. 6. Paint the hat black with acrylic paint and let it dry. Paint the rim of the hat on both sides. 7. Glue the hat to bottom of another cup. Draw eyes near the rim of the hat. 8. Cut the orange pompom into a carrot shape, making one side a little pointy. Then using a pen draw a circle a little bit smaller than the diameter of your pompom. Stick the pompom in the hole. 9. Draw a mouth on the cup and then cut feet shapes from the black craft foam and glue them to the rim of the cup. You may also want to add arms. 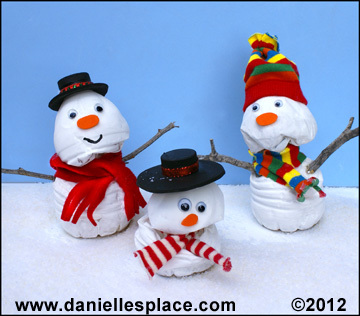 Use these snowmen to act out the song "I'm a Little Snowman Short and Stout". "I'm a Little Snowman Short and Stout"
Ill be back next year so don't you pout! ©2011, Digital by Design, - Copyright Information - It is illegal to copy this poem and post it on another web site or anywhere on the web without permission, even if you include the authors name and copyright notice, or change it a little (derivative work) . 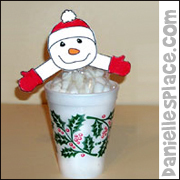 You can also make a cup snowman a puppet. 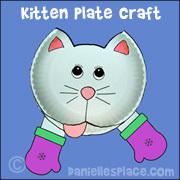 Use the larger cup size to make puppets. Instead of inserting a pompom for the nose, have your children stick their hands inside the cup and put the tip of their index fingers through the holes. They can use craft felt or material to decorate the hat and make a scarf. "I'm a Little Snowman Tall and Slim"
If I start melting, you better swim! Ill be back next year, so don't be grim. I have to go now, or Ill lose my limbs. ©2011, Digital by Design, - Copyright Information - It is illegal to copy this poem and post it on another web site or anywhere on the web without permission, even if you include the authors name and copyright notice, or change it a little (derivative work). Children will love the creative illustrations in this book. Using collage and found objects such as food, yarn, and nuts Ehlert creates an amazing array of snow people. After reading this book have your children make their own found-object snow people using materials they find around the house or outside. Collect stuff that birds like to eat: popcorn, seeds, nuts, dried grains, berries, etc. and decorate your snow people with them. Watch as the birds come and visit your snow people for a bite to eat. There is a recipe at the back of the book for popcorn balls using light corn syrup. Children will also enjoy peanut butter popcorn balls. You can find a recipe for these on Cooks.com. 1. Make the snow background first. Cut a piece of bubble wrap with the smaller bubble the same size as you paper. 2. Spread white paint over the tops of the bubbles to cover. 3. Carefully turn the bubble wrap over and place it on the paper. Press it down so the paint sticks to the paper, and then slowly peel it off. 4. 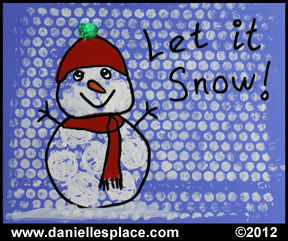 While the background is drying draw a snowman on the smooth size of the large bubble wrap and cut it out. 5. Spread white paint over the tops of the bubble to cover and press the paint side down on your background paper where you want the snowman. Let it dry. 6. To finish your picture outline the snowman and draw in details with a black marker. Paint the hat, scarf, and carrot nose, and add words. © 2012, Digital by Design, Inc. - See Copyright Information - Do not link to the snowflake pattern pages - link to this page only. 2. Cut the snowman and body pages out. 3. Staple the body pages together and tape them to the back of the snowman. 4. 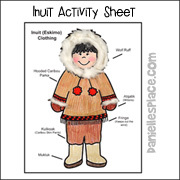 Have your child color the snowman and write "How to Build a Snowman" on the body. You can also have your child cut snowman arms from black construction paper and glue them to the snowmans body. 5. Have your child use the pages to write directions on how to build a snowman. Or you can have your children make up a story about a snowman, and write the title on the snowmans body. © 2010, Digital by Design, Inc. - See Copyright Information - Do not link to the snowflake pattern pages - link to this page only. Before class cut the snowman parts from construction paper. 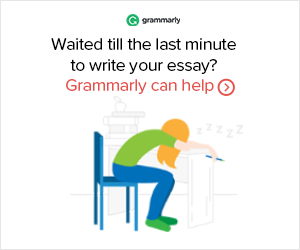 In class ask your students review questions from their lesson. If a child answers a question correctly, he gets to put part of the snowman together. Keep playing until the whole snowman is put together. This game is played like hangman except children remove a snowman part until the entire snowman has "melted" away. Before class cut out the snowman pieces. (Use the pattern above.) You can laminate the pieces and add velcro tabs so the pieces can be used over an over again on a flannel board. In class give your students a list of vocabulary or spelling words. Have one child secretly pick a word, count the number of letters in the word and then draw that many spaces on a piece of paper. Have your students take turns guessing letters that might be in the words. If a letter is guessed that is not in the word a part of the snowman is taken away. If the children guess the word before the whole snowman "melts" away, another child takes a turn being the person who picks a word. Play until all the children have had a turn picking a word. This bulletin board display can help keep your home school from falling into the winter blahs. Children will get excited about seeing how much they are learning when they see all the snowflakes piling up. 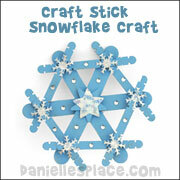 Go to the Snowflake Crafts Page for ideas on how to use this bulletin board display. 1. Clean and dry the milk jug and pop bottle. 2. 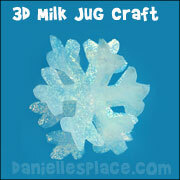 Pour a few cups of sand in the bottom of the milk jug to add weight to your snowman. 3. Cut off the bottom of the 2-liter bottle about 7 1/2" from the top of the bottle. 4. Glue the top of the bottle to the top of the milk jug with a low temp. glue gun. 5. Spray paint the jugs with white spray paint or use acrylic paint. 6. Draw a face on the snowman with permanent markers. 8. Cut a scarf 5 x 24" from the material. Cut 1/4 slits at each end to make the frill. Tie the scarf it to the snowmans neck. 9. To make the hat paint a large plastic cup black. Cut an 8" circle from black craft foam, cut out the center, and glue it to the cup. Glue some ribbon or material around the top of the cup to finish the hat. Glue it to the head of the snowman. 1. Flatten a sock so that the heel part of the sock is facing up. 2. Fill the sock with poly-fil to just below the heel of the sock. 3. To make the arms roll a wad of poly-fil into a ball about one inch in diameter and stick it inside the sock so that it is just below the heel to one side of the sock. Use your pointer finger to press the ball up against the side of the sock so that you can see your finger and ball shape from the outside of the sock. Grab the ball of Poly-fil from the outside of the sock and wrap a rubber band around the ball to form an arm as shown in the picture. Do the same thing to the other side of the sock. 4. Place a rubber band just above the arms to form the neck. 5. Put in more stuffing to form the head and secure the top with a rubber band. Cut off the cuff of the sock just above the rubber band. 6. cut the cuff off another sock of a different color to make the hat. Secure the cut end with a rubber band of the same color. 7. To make the scarf cut a long strip about 1" wide from the same sock. Stretch it out a little and tie it around the neck of the snowman. 8. To finish glue on tiny black pompoms for the eyes and buttons. Cut an orange pompom into a carrot shape and glue it to the face. 1. Draw snowmen so that they look like they are hanging onto a rope. Use the picture above to give you an idea of how to do this. Or print out the patterns, color them, and cut them out. Roll out your ribbon and place the snowmen on the ribbon as shown in the order you would like them to appear. Write letters on their bellies to spell out a message. This little snowman is holding a star in one hand and a candy cane in the other. 1. Draw a snowman holding a candy cane in one hand as shown in the picture and then color it. Also draw a star to place in the snowmans other hand. Or print out the pattern (Available to members) and color it. Cut out the snowmen and star. 2. Use an Exacto knife to cut out around the thumb on the lower hand. 3. Write "to:" and "from:" on the star and insert it under the thumb. 4. 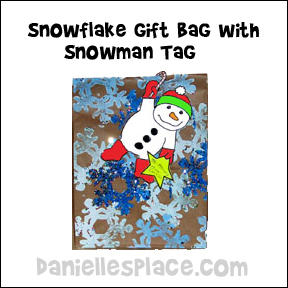 Decorate a lunch bag with a snowflake rubber stamp and paint. Sprinkle glitter on the wet paint. Let the bag dry and then place your gift inside. Fold down the top a couple of times and staple it closed. Hang your snowman gift tag from the top of the bag. Tape it to the bag so it won't fall off. 1. 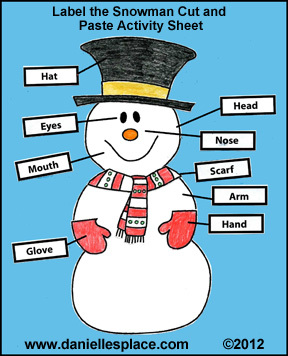 Draw a snowman head and hands onto card stock and cut them out. Or use the patterns. This pattern comes with a front and back head for each snowman. 2. Place enough chocolate mix into the small plastic bags to make one drink according to the directions and seal the bag. 3. Place all the supplies that will be needed (except for the marshmallows and paint and crayons) for each child in a brown lunch bag (see below). 4. 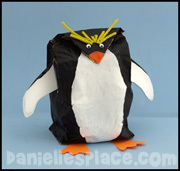 Prepare a craft ahead of time so the children can see what they look like. 5. Place a half a cup of marshmallows in the large party bag and seal it with tape. Cut off the excess at the top. 6. Color the head (back and front) and the arms. Tape the arms at the bottom of the head or onto the bag. Tape the head onto the top of the bag. Tape the back of the head onto the back covering up the top of the plastic bag. Write the directions (or have the children write the directions) on how to make the hot chocolate on a piece of paper and place it in the bottom of the cup with the powdered chocolate mix. Place the snowman on top. You can also include a plastic spoon if you would like. 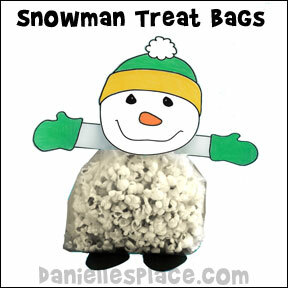 Place the snowman in the cup in a decorated lunch bag (below). 1. Glue the two 8 3/4" Chinet plates together bottom to bottom. This makes the bottom circle of the snowman. 2. Glue the edge of a 20 oz. bowel face up to the paper plates to make the middle circle of the snowman. 4. Fold black pipe cleaners into arm and hand shapes and glue them to the middle circle as shown in the picture. 5. To make the snowmans hat. Draw a line from the center of a 10 oz. 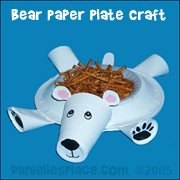 paper plate to the outside edge as shown in the picture. Cut on the line. 6. Bring the cut edge of the paper plate over the other cut edge to make the hat shape as shown in the picture to the left. Glue it closed with a hot melt glue gun. Smash down the hat a little as shown in the picture. Paint the hat with acrylic paint and let it dry. Glue a pompom on the top. Glue the hat to the head of the snowman as shown in the picture. Fill the snowmans body with goodies. White goodies work best. 1. Print out the pattern or let the children make their own snowman. Pattern available to members. 2. Fill a plastic bag with crunched up peanuts and seal the bag. Fold in the top two corners and staple them down. Draw a snowman head, arms and feet and cut them out. Tape them to the bag as shown in the picture. *This craft can also be made into a great gift by placing gourmet popcorn inside the bag instead of packaging peanuts. 1. Using a standard 8 1/2 " x 11" paper, fold the paper so one corner touches the other side of the paper and is even with the straight edge. Cut away the part of the paper that is not covered by the folded-over edge. If you open up the folded paper you will have a square piece of paper. You can do this with any size paper. 2. Fold the paper in half again. As show in the diagram at the right. 3. Fold the paper in half again. As show in the diagram at the right. have folds. If you would like a round snowflake, cut the unfolded edge so that it has a rounded shape as show in the diagram below. Cut notches in the folded sides, but do not go all the way through to the other folded side or you will cut your snowflake in half. 5. If you cut a triangle shape from the tip of your triangle, as shown in the diagram, you will make a star shape in the middle of your snowflake. 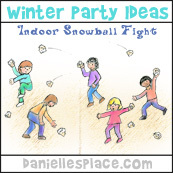 Children try to catch other players by landing on the same snowflake. 1. Print out the game board patterns onto card stock (heavy paper) and tape them together to make the game board. 2. Make up question cards for whatever you are reviewing. Use math fact cards if you are reviewing math facts. 1. This game is played similar to the outside winter game "Cut The Pie". To start players place their markers on any of the snowflakes on the pie shape. Each player must pick a different snowflake. Pick one player to be the tagger by the role of a die. The highest number gets to be the tagger. That player places his marker in the center of the pie. 2. Players take turns answering questions. If a question is answered correctly by a player, that player gets to throw a die and move that many spaces in any direction. When all the players have moved the player that is the tagger throws the die and tries to get the other player out by landing on a player (landing in the same space). 3. The last player left on the board besides the tagger wins and gets to be the new tagger. 4. 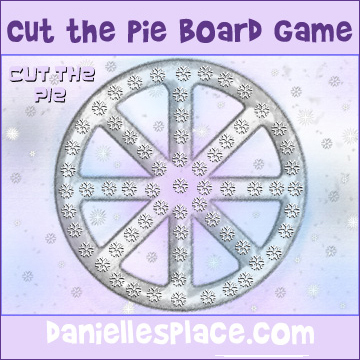 When you have finished playing this game go outside in the snow and play "Cut the Pie". Make a large pie shape in the snow. One player is "it" and stands in the center of the pie. "It" runs around the pie trying to tag the other players. If a player is tagged, he is then the new "it" and must try to tag another person. Go to the Winter Party Outreach Page for directions. You don't need snow to make a snowman. Just stuff white garbage bags full of crumpled up paper or old leaves and then add the snowman accessories! Snowman Parts Foam Shapes Adhesive 300 Pieces!